The National Museum of Modern and Contemporary Art (MMCA) at Gwacheon was my first real exposure to Korean modern and contemporary art. I had thrown myself in the deep end. The collection was 99% Korean and all from after 1954. That was okay Korean art had thrown itself into the deep-end of modern art after the Korean War and were still giving it everything they can. 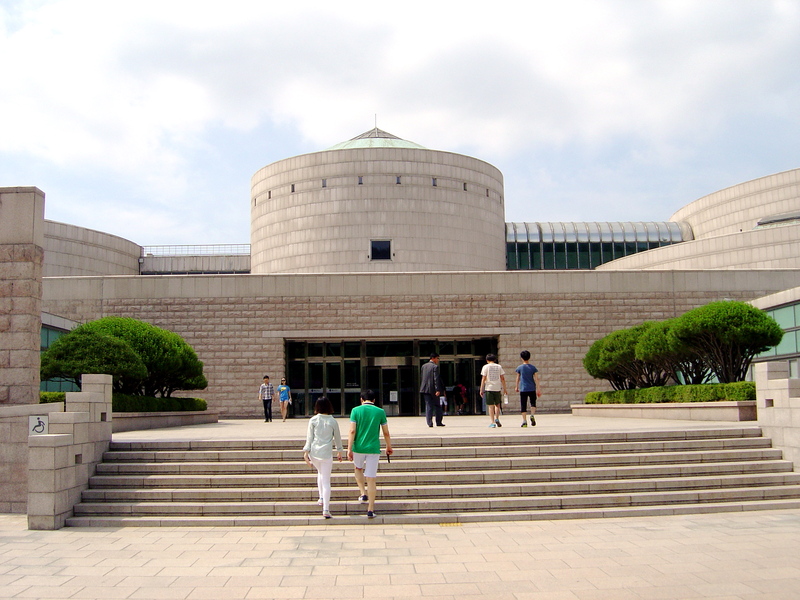 It is a massive collection of Korean art – it is hard to know where to start. I started with the large retrospective exhibition of Youn Myeung-ro paintings. In Youn Myeung-ro’s paintings I could see references to precursors in traditional Korean ceramics. I then worked my way through the rest of the three floors of the museum with painting, photography, sculpture, installations, architecture and jewellery. There is lots of exciting contemporary art. Park Jaeyoung’s showcase of mind-control devices from the “DownLeit Corp.” and Gu Minja’s installations about places of display from the shop display of the “Atlantic – Pacific Co.” to “The Square Table: Public Hearing of the recruitment requirements for artist –position civil servant.” Kim Tae-dong’s “Daybreak” series of photographs was a vision that haunted my view of Seoul at night. The MMCA is surrounded by a large and pleasant sculpture garden with the disconcerting sound shrieks of pleasure of the fun park across the road. And this is all set within the Seoul Grand Park, a lot of parkland. The museum building was completed in 1986. 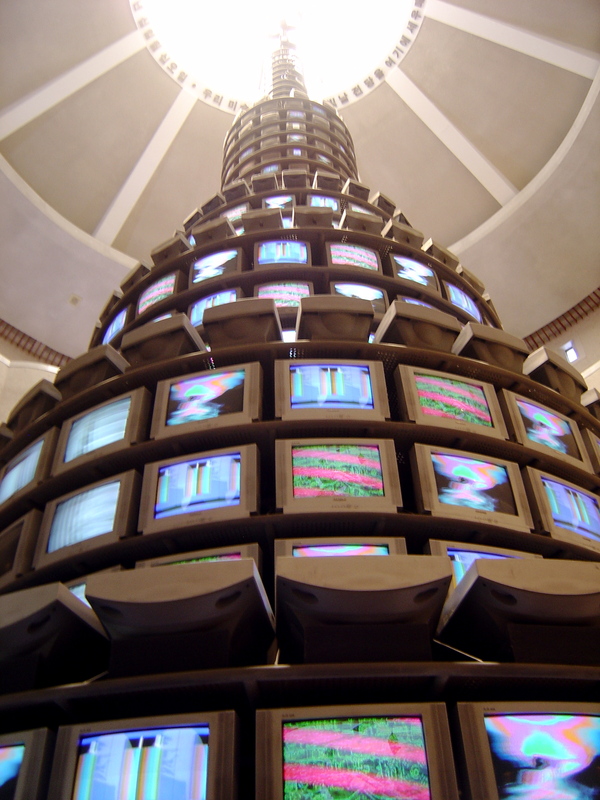 It is large and designed around Nam June Paik’s pagonda of 1000+ TV sets and videos “Dadaikseon <The More, the Better>”. It was created for the Seoul Olympics and it is now in the museum’s central tower with a circular ramp going up and around like a mini Guggenheim. I was hoping and expecting to see more of Nam’s art in Korea, I only saw a few works but what I did see was great. I notice that they are building another branch of the MMCA in the centre of Seoul next to the grand Gyeongbokgung Palace (that will be more convenient for international tourists like me) and that there is another branch already open at Deoksugung. 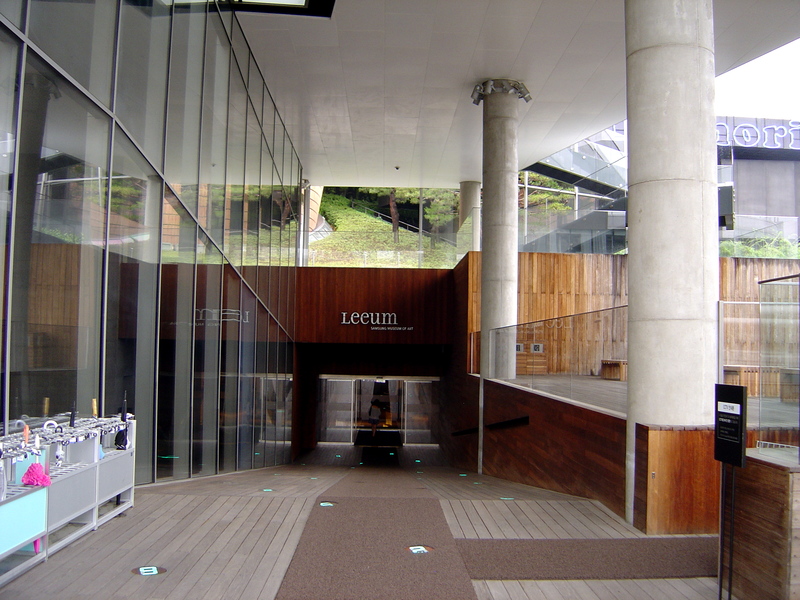 The Leeum Samsung Museum of Art would have been an easier start on Korean art world and more complete introduction with traditional, modern and contemporary Korean art, along with world-class, international modern and contemporary art. The elegant museum building opened in 2004. I was expecting that the Korean art collections might be more biased towards the American art rather than the European or British art for reasons of geopolitical influence, but the Leeum collection’s certainly wasn’t, there is great balance to its international collection (better than MOMA). The only bias that I could detect was for Korean art and Leeum has a fine collection of traditional celadon ceramics, Buddhist paintings and sculptures from the ancient Silla Dynasty in the 4th century to the recent Joseon Dynasty. It also has the best collection of contemporary art that I’ve seen in a single gallery space. You entered the space through a Felix Gonzalez-Torres curtain of beads to find yourself reflected in an Amish Kapour hexagonal mirror. Around the corner is a recent Gilbert and George, both of them looking like My Favourite Martian with the stems of gingko tree leaves sprouting from their heads, or rather the mirror image of half their heads. The mirror backed medicine cabinet by Damien Hirst is facing and reflecting a Cindy Sherman wall work with mirror images in the background. I laughed out loud at another kind of mirror reflection image by Nam June Paik “My Faust Communion” with demonic images on tv sets arranged in an altar piece. Lee Bul’s white cyborg sculpture was hanging from the ceiling. There were also two floral artworks one by Koons and one by Warhol (I will get to flowers in my next post about Korean art galleries). This entry was posted on Tuesday, July 2nd, 2013 at 10:22 PM	and tagged with Korea, korean ceramics, lee bul, Leeum Samsung Museum of Art, nam june paik, National Museum of Modern and Contemporary Art (MMCA), Seoul and posted in Art Galleries & Exhibitions, Travel. You can follow any responses to this entry through the RSS 2.0 feed.